See fingerprint drug testing in action in our video here. 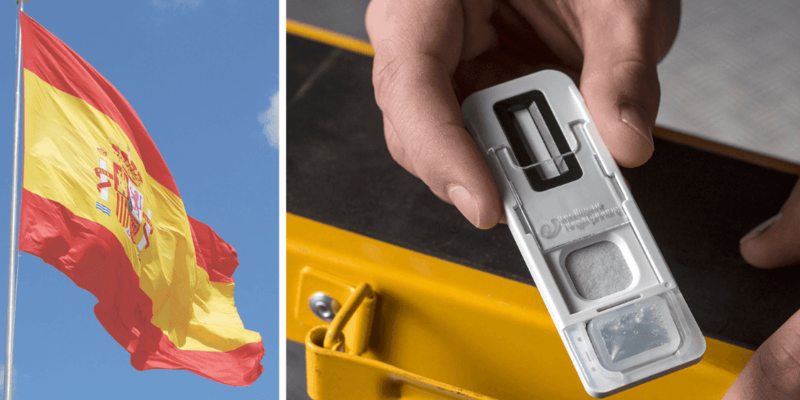 The world’s first portable fingerprint drug test has been launched by UK company Intelligent Fingerprinting. Available now, the revolutionary system is hygienic and easy-to-use, collecting fingerprint samples in just five seconds and delivering simultaneous screening results for the four main drug groups – cocaine, opiates, cannabis and amphetamines – in under ten minutes. Initial applications for the system include support for drug testing programmes within drug rehabilitation, workplace and criminal justice arenas. Organisations using the new system – which have previously been reliant on collecting saliva and urine samples for drug screening – will benefit from the simplicity and improved hygiene of fingerprint drug tests. Those being tested appreciate the system’s dignified and non-invasive collection method. Intelligent Fingerprinting’s fingerprint drug test technology – which consists of a fingerprint sample collection cartridge and the portable Reader 1000 analysis unit – works by analysing the tiny traces of sweat contained in a fingerprint to detect drugs and drug metabolites. Drug metabolites are substances produced by the body when it processes (metabolises) drugs of abuse, and they are excreted in sweat. The four drug groups detected by Intelligent Fingerprinting’s Drug Screening Cartridge cover the majority of mainstream drug misuse, ensuring that the company’s new drug testing system can support a broad range of drug screening requirements immediately. “We plan to further publish our findings and present at upcoming scientific conferences and customer events, and our collaborators will do the same as we work together to share the potential of this breakthrough in rapid diagnostic screening,” Dr Walker continued. Collecting a fingerprint sweat sample on the cartridge takes just five seconds. 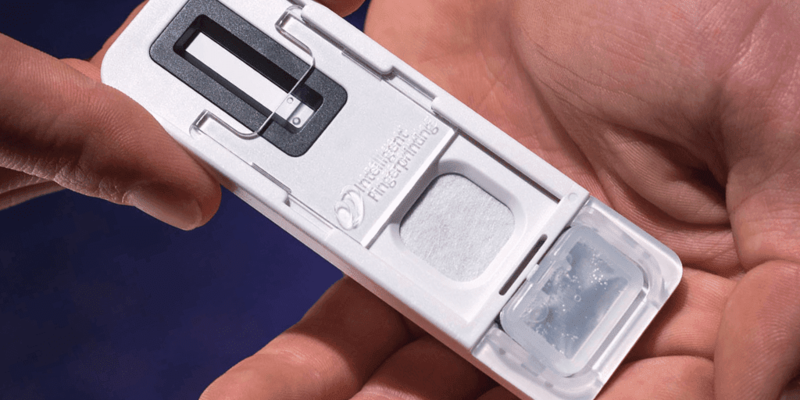 The cartridge is then inserted into a reader that analyses the fingerprint sweat to provide a positive or negative result for each drug in the test in under 10 minutes. Intelligent Fingerprinting’s portable fingerprint-based drug screening system is based on initial science conducted by Professor David Russell at the University of East Anglia (UEA) some ten years ago, and is the result of years of intense R&D and over £10 million of development funding. The company has a number of external collaborations including those with LGC, University of Surrey, King’s College London and the National Physical Laboratory, all of which are focused on gaining a better understanding of the power of fingerprint-based diagnostics. 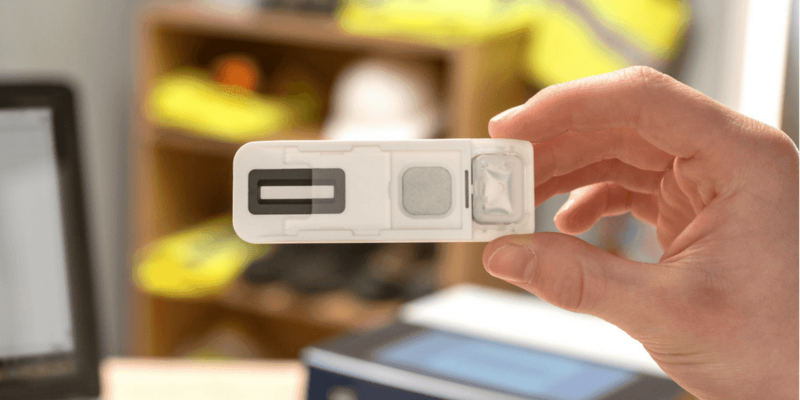 The company’s ground-breaking technology detects drug use by analysing substances, known as metabolites, contained in the minute traces of sweat found in a fingerprint. (Metabolites are substances produced by the body as a result of normal metabolic processes.) The Intelligent Fingerprinting Drug Screening System looks for the presence of specific drugs or drug metabolites in the test subject’s fingerprint sweat sample and, if detected, identifies which drugs have been consumed.